Something Burning - Are We Becoming Nature’s Very Own Cyborgs? Are We Becoming Nature’s Very Own Cyborgs? Yeah, your your mom and dad deserve some credit for how much information your brain can jam in, retain and recall -- and how fast. The foundation of our ability to process information is indeed genetic. Thankfully for our children, though, despite what they've inherited from us, they can do a great deal to build more capacity and brain speed for themselves. Eat well, sleep more, drink less, read poems more..., the science of "how to get smarter" is neverending. And if that doesn't work, no worries -- the technology we're building will get smarter on our behalf, right? Either way, as long as we consider technology an extension of (and not a replacement for) our brainpower, there's no reason why we should ever see a generation with less brainpower than its parents. Kevin Roberts, Worldwide CEO of Saatchi & Saatchi, posted last week on how different living creatures experience the passage of time. Roberts compares the visual processing speed of flies, dogs, humans and turtles: Vision is a powerful sense, but does it have the power to stop time? Recent research indicates that time moves at a slower rate for some creatures. If you’re a fly, you can process close to seven times as much info in a second as a human, which is why houseflies split their sides over our attempts to swat them – they see us coming in slow mo. If you’re a dog you can process information at twice the rate of human, which is why TV is of little interest. A flickering image is all dogs see. If you’re a leatherback turtle on the other hand, time flies. Those guys get roughly a third of the information that we do in a second. It seems that perception of time has to do with size and metabolic rate. Perhaps nature is nodding to the little guys. Now, how to be as fast as a fly and laid back as a turtle? That's interesting stuff. Reminds me of how we used to experiment with the speed and duration of programming on MTV's college network, mtvU. By slowing things down, we were able to break through the clutter of our own network and give certain messages the space and time needed to connect and engage college students who were half-watching. Funny how when something on TV slows down or gets quiet, we look up to see what's happening. What Roberts' blog post doesn't get to are the differences we're starting to see between us humans, the generational shifts that make one generation look at the next generation and wonder why it's moving so fast. The Species Millennial (born 1981-2000) seems to be moving at light speed, processing information so fast it's hard to believe they're actually processing anything at all. Especially to those of us who are, er, older. Millennials are moving so fast, we say, they can't possibly concentrate on anything, finish anything or appreciate anything. Pretty bleak. And not true. Cognitive scientist Andy Clark studies how our brains respond to the world around us becoming smarter, getting to know us better and better. Clark explores the notion that the power of our minds extends beyond the limits of the "fortress of skin and skull" that protects our brains. In studying the technologies we've built to solve problems and learn alongside (or ahead of) us, Clark shows how our inherited computational apparatus is now more sophisticated than any in the history of mankind. In other words, the development of our mental capacity is cosmological, limitless, because we are turning ourselves into cyborgs (but, like, in a good way!). 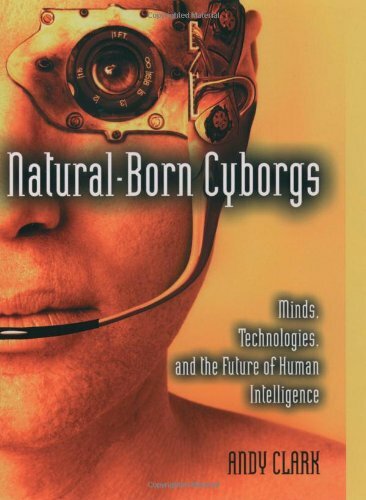 Here's Clark: We cannot see ourselves aright until we see ourselves as nature's very own cyborgs: cognitive hybrids who repeatedly occupy regions of design space radically different from those of our biological forbears. The hard task, of course, is now to transform all this from (mere) impressionistic sketch into a balanced scientific account of the extended mind. The fundamental question becomes: Where does our mind end and the rest of the world begin? Millennials don't see the difference.